The USAG nationals lineup is almost set! With one week of qualifying scores left to go, UIC, Lindenwood, Bridgeport, Yale, Air Force, Texas Woman’s and Cornell have confirmed their spots. That leaves just one left to go, and after weeks of missed opportunities, Brown finally had a good meet and leapfrogged West Chester into the last qualifying spot. West Chester still has a chance to break back in at conference championship though. We also saw numerous program record individual scores this week and some of the highest individual scores of the season. We wanted to show more love to the non-top teams in college gym in 2019, so we broke out our Dismounts into DI, DII (all USAG nationals teams) and DIII. Each week, we’re also dishing out a few superlatives for some of our favorite moments, looks and results from the weekend of competition. Below those, you’ll find your typical results and highlights from every DII and USAG nationals-eligible team’s meet. For reference, teams eligible for USAG nationals include those with less than seven and a half full scholarships. They include, Ivy league schools, all DII teams, Air Force, Centenary and SEMO. Note: Penn has opted out of competing at USAG nationals this year, but we will continue to feature it here. The Bridgeport sophomore has been doing one of the most beautiful bars sets in USAG for the last two years, so it’s great to see her rewarded with a program record score. If you’ve never watched her, treat yourself. The Jaeger is just sublime. Check out highlights from our floor squad at Arkansas earning a season-high 49.30! Lindenwood put together the single highest scoring rotation of the USAG season at Arkansas, registering a 49.300 on floor. West Chester has had two separate athletes tie its beam program record of 9.875 this year. Boyd’s set from this weekend is one of them. It’s incredibly smooth and precise, and totally deserves her epic fist pump when she sticks her gainer pike dismount. The Big Storyline: Penn struggled on the road this week, coming in over three points short of its program record from last weekend. Caroline Moore’s impressive beam routine was still the best single score of the meet. Implications: Neither team has any significant change in the rankings. The Big Storyline: Air Force had a solid meet at Auburn, appropriately participating in a “Hometown Heroes” meet that recognized the military and first responders. Tyler Davis set a season high on floor and picked up an individual title there. Implications: Air Force will drop to No. 53 nationally, but it’ll remain at No. 5 in USAG, several tenths clear of Texas Woman’s in No. 6. The Big Storyline: Centenary had a solid meet on Friday night but wasn’t able to improve its NQS. Implications: The Ladies’ ranking will stay the same. The Big Storyline: Seattle Pacific wasn’t able to lift its NQS, but it did set several individual season highs. Implications: The Falcons will remain at No. 11 in USAG and No. 65 nationally. The Big Storyline: Yale had a fantastic meet at Davis, registering the fifth-highest score in program history and coming close to an upset of UCD despite the absence of sophomore star Jacey Baldovino. Freshman Lindsay Chia anchored the Bulldogs’ beam lineup for the first time in her career, registering a career high 9.850. Jessica Wang set a new program record for Yale on bars. Implications: The Bulldogs’ rankings remain the same. They will be the No. 2 seed at the ECAC championship this week. Records: The 2019 team is the first in Yale history to score over 194 five times in a season. Wang’s 9.925 on bars is a program record. Controversies: Senior Kiarra Alleyne took a painful-looking fall on floor. We’re hoping that it was nothing serious. The Big Storyline: West Chester set a season high to defeat Cornell after a shaky beam rotation for the Big Red. The Rams’ Sarah Boyd tied the program record 9.875 on beam, and Jessica Meakim tied the floor record of 9.925. Meakim’s floor routine also led the first West Chester rotation to break 49.0 so far in 2019. Cornell’s Donna Webster picked up two event titles to lead the team. Implications: Despite the season high, West Chester will fall behind Brown and drop out of qualifying position for USAG nationals. The Big Storyline: Bridgeport’s spectacular bars rotation, totaling 49.175, led the Purple Knights to a resounding win over conference-mate SCSU despite yet another error-ridden beam rotation. Sophomore Kathryn Doran led the charge with a 9.925 that ties the program record. SCSU registered a solid score on senior night, and star freshman Hannah Stahlbrodt tied for the floor title. Implications: SCSU will rise one spot to No. 65 nationally. The Big Storyline: Lindenwood had a great meet, cracking 195 for the fifth time in 2019 and adding a healthy boost to its NQS. The Lions totaled a spectacular 49.300 on floor. Texas Woman’s continues to struggle despite the best efforts of senior Erin Alderman, and SEMO’s Anna Kaziska continued to impress with yet another 9.900 on floor. Implications: Lindenwood is on the very cusp of making regionals. It will be seeded No. 2 at MICs, joined by TWU at No. 3 and SEMO at No. 6. Records: Lindenwood’s Courtney Mitchell and Breanna Franklin each scored 9.900 on floor for career highs. SEMO’s Mackenzie Slee earned a career high 9.825 on floor. 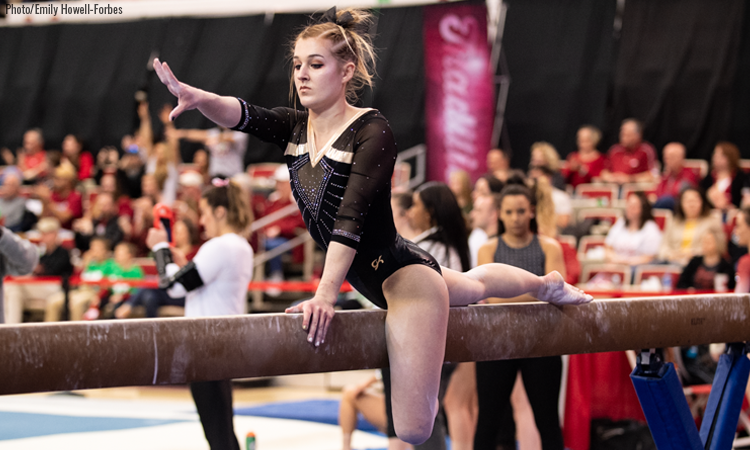 The Big Storyline: Brown set a season high in spectacular form on senior night, breaking 194 for the first time in 2019 and jumping into qualifying position for USAG nationals. Star freshman Mei Li Costa impressed with a 9.900 on bars that is a personal best and ties the school record. Bridgeport put up a solid high-194 despite its fifth mistake-ridden beam rotation in a row. There were highlights anyway: Julianna Roland picked up two event titles and set career highs in both as well as the all around. Fellow freshman Crystal Gwinn’s 9.900 floor was also a career high. Implications: Brown can confirm its spot at USAG nationals with a 193.000 at conference. It jumps three spots to No. 61 nationally. Bridgeport also improved by one to No. 46 nationally. The Big Storyline: In its second meet of the weekend, Cornell gymnasts matched two program records. Claire Haklik’s 9.925 on floor and Donna Webster’s 9.900 vault are the best scores that Big Red gymnasts have ever registered. Implications: Cornell has officially qualified to USAG nationals and could threaten many of the top teams if it can assemble a complete meet on the day. The Big Storyline: UIC fell short of a score that would have improved its NQS on Sunday, leaving the door open for Lindenwood to secure the No. 1 seed at USAGs. The Flames struggled on bars and beam, ending their 10-meet win streak. Implications: UIC enters the last week before regionals at No. 35 and will need a 195.925 at conference to clinch its spot there. It will also need to beat Lindenwood by several tenths to keep the No. 1 seed going into USAG nationals. Controversies: The UIC coaches felt the scores on beam were low. It was difficult to tell whether that was true since the BTN+/Flo stream rarely moved away from Michigan State.